I am an astrophysicist, and a professor in the School of Earth and Space Exploration at Arizona State University. These pages provide a brief overview of some of my research. The SESE web pages provide further information on ASU's Astronomy and Astrophysics research programs, Cosmology Initiative, and astronomy and astrophysics graduate school in SESE. Most of my work in observational cosmology, galaxy formation, and galaxy evolution is done in collaboration with ASU Professor Sangeeta Malhotra. 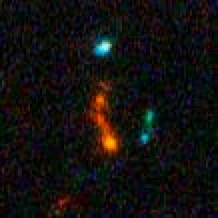 The youngest galaxies in the early universe can tell us most directly about the process and history of galaxy formation. These young galaxies contain many young, hot stars, whose energetic photons are expected to ionize their gas. The ionized gas will then glow strongly in the Lyman alpha line (i.e., the 2-1 transition of neutral hydrogen). By searching for strong sources of Lyman alpha emission, we have identified large samples of star forming galaxies in the early universe. The Large Area Lyman Alpha (LALA) survey is a narrowband imaging program at redshifts z=4.5, 5.7, and 6.5 that has covered 106 cMpc3 and identified about 500 Lyman alpha galaxies. We have about 250 spectroscopic confirmations from LALA and from related projects. The Deep and Wide Narrowband (DAWN) survey is an ongoing forty-night survey program using the NEWFIRM camera at the 4m Mayall telescope of the Kitt Peak National Observatory. DAWN is observing five fields with a narrow bandpass filter (1.06 micron central wavelength and 3.5nm bandpass). These fields will range in narrowband integration times from 10 to over 50 hours, with one ultra-deep field (COSMOS), two deep fields (UDS and EGS), and two medium-deep fields (CFHTLS-D4 and MACS0717). DAWN will answer key open questions about the evolution of Lyman alpha galaxy numbers in the epoch of reionization, and their potential implications for determining reionization history. It will also enable sensitive studies of faint star forming galaxies across a wide range of cosmic time. These projects exploit the low background, high throughput, and unmatched spatial resolution of the Hubble Space Telescope's slitless spectroscopic modes to obtain some of the most sensitive spectra ever. Core science includes studying the Lyman break galaxy populations at redshifts z=4 to z=6.5; searching for both Lyman alpha galaxies in this redshift range and other emission line galaxies closer to home; studying older stellar populastions at intermediate redshifts; and even studying the distribution of faint stars in our own Galaxy. The Faint Infrared Grism Survey is a new cycle 22 Treasury program on the Hubble Space Telescope, led by ASU professor Sangeeta Malhotra. FIGS will use the Hubble Space Telescope for an aggregate of 10 full days (160 orbits) to obtain the most sensitive continuum spectra yet obtained at near infrared wavelengths, using the Wide Field Camera 3- IR channel's G102 slitless grism. Gamma ray bursts (or GRBs) are short-lived sources of high energy photons that occur about once a day over the full sky. They may last anywhere between 1000 seconds and 0.01 second. In that brief time, they emit tremendous energy: 1051 to 1054 ergs. In 1993, Bohdan Paczynski and I predicted that observable radio afterglows would follow GRBs after a lag of days. The first such radio afterglow was observed in 1997, three months after the first optical afterglow. Identification of these long wavelength counterparts to GRBs opened the way for major progress in understanding their nature, beginning with direct distance measurements to GRB afterglows. Starting in 1997, I worked on devising tests for collimation of gamma ray bursts. One of the tests I suggested has been used to show that GRB energies are about 100 to 1000 times smaller than one might naively guess. I have also been active in observations of GRB afterglows, primarily at optical and near-infrared wavelengths. I am an affiliate member of the science team for the Swift satellite, which is the best GRB hunting mission to date. Wide field surveys in the far red and near-infrared wavelength ranges are critically important for future progress in understanding how galaxies formed and evolved in the early universe, and how they ionized the hydrogen between the galaxies. I am interested in instrumentation that will help perform such surveys- through wide field imaging or slitless spectroscopy, on the ground or in space. Currently, I am a science team member for the Star Formation Camera instrument on the Theia mission concept. I am also exploring possibilities for wide-field, narrowband-capable near-infrared cameras on a range of large ground based telescopes. I have a strong interest in filter development for astronomical instruments, springing from our extensive use of narrowband filters in Lyman alpha galaxy hunting. I led three NSF proposals for an The Infrared Widefield Imager (IWI), which was to be a wide field (21 x 21 arcminute) near infrared (zYJH band) capability for the Large Binocular Telescope. IWI would function as an integral component of the existing Large Binocular Camera, and would use JWST NIRCam heritage chips, provided by Marcia Rieke and the NIRCam team at University of Arizona. IWI has not been funded, though it remains a viable instrument concept that would provide a better survey efficiency in the Y, J, and H bands than any existing telescope + camera combination in the near-IR. I was also a science team member for the DESTINY Joint Dark Energy Mission concept, one of only three funded by NASA for development. DESTINY would use repeated, deep spectroscopic observations of two patches of sky to identify and study distant type Ia supernovae, and use their measured fluxes and redshifts to study the nature of the dark energy that dominates the makeup of the present day universe. It would also conduct a complimentary weak lensing survey, thus studying the same phenomenon in two entirely independent ways. See the NOAO press release on DESTINY. Arizona State University is a large, state-supported university located in Tempe, in the Phoenix metropolitan area. ASU astronomers have access to the state-funded Arizona telescope system, which includes world class telescopes in south-eastern Arizona (LBT, MMT) and in Chile (Magellan). All ASU astronomers (faculty, postdocs, and gradudate students) can lead proposals for observing time on any of these telescopes. Astronomy at ASU resides in the School of Earth and Space Exploration, along with planetary science, geology, and some engineering. We have a group of about a dozen astronomy professors, and some 20-25 graduate students in our astrophysis PhD program. We have an active research environment with regular seminars, colloquia, lunches, and coffee discussions. Our recent PhD graduates have gone on to postdoctoral fellowships at UC Davis, Texas A+M, UC Riverside, and NASA's Goddard Space Flight Center. Phoenix offers big-city amenities, a warm climate, and great access to outdoor recreation... so if you're considering graduate school in astronomy, please take a look at what we have to offer! Some useful web links on my web resources page.